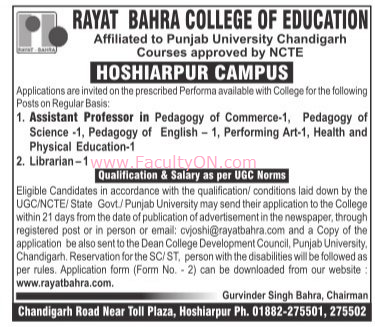 Rayat Bahra College of Education, Hoshiarpur has advertised in TRIBUNE newspaper for recruitment of Non-Teaching Faculty- Assistant Professor / Librarian jobs vacancies. Interested and eligible job aspirants are requested to apply within 21 days from 10th October 2018. Check out further more details below. About College: "Rayat Bahra college of education" RBCE, Hoshiarpur became functional from September 2008 and is continuously engaged in imparting education of international standards and excellence for producing skilled, effective, efficient and learning teachers to meet the future requirements of this technological advanced era and also committed to provide useful services to the society and world as a whole. As per UGC / NCTE / State Govt / Punjab University norms. How to Apply: Interested and eligible candidates are requested to send application with copies of certificates and recent PP size photo attached in CV to the email address provided below or postal address given here or apply in person and send a copy to the dean address provided below.